Join Sika at World of Concrete 2019 and earn CEU credits by attending our Tuesday session,"Adding Value to Slab-on-Ground Systems: Admixtures to Flooring". If you've already registered for World Of Concrete, simply add our session to your schedule! First 25 registrants to our Tuesday Session at WOC receive a $25 Amazon Gift Card. Sika Slab Solutions (Sika Corporation) presents this new session for engineers, owners, concrete producers and concrete/flooring contractors interested in learning about an innovative single source approach to Slab-on-Ground construction for any application. During this session, several recent projects will be presented, discussed and evaluated. Presentations will contain technical content and focus on idea exchange providing attendees a unique opportunity to share ideas and opportunities related to innovations in modern slab-on-ground construction. Haven't registered for WOC yet? Or already registered and want to add the Value to Slab-on-Ground Systems forum to your Education Sessions? We've provided a guide for how to register for the event and sign up for educational sessions. Click Here to download the Registration Tips. If you're still having problems, complete the form above and a representative will be in touch with you as soon as possible to help you with your registration process. Would you like a discounted registration? ACI is offering $20 exhibit floor access, via online registration only, and discounted seminars to World of Concrete. Source Code A21. PCI is offering $25 exhibit floor access, via online registration only, and discounted seminars to World of Concrete. Source Code A34. 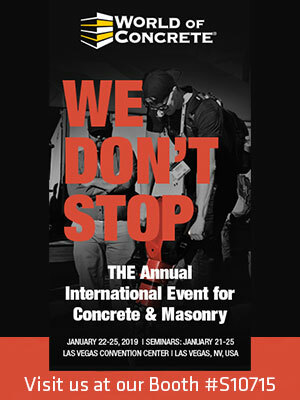 We look forward to seeing you at World of Concrete 2019! Be sure to stop by and see us at Booth # S10715 in the South Hall! Sika is a specialty chemicals company with a leading position in the development and production of systems and products for bonding, sealing, damping, reinforcing and protecting in the building sector and automotive industry. Sika has subsidiaries in 101 countries around the world and manufactures in over 200 factories. In 2017, our more than 18,000 employees generated sales of CHF 6.25 billion.